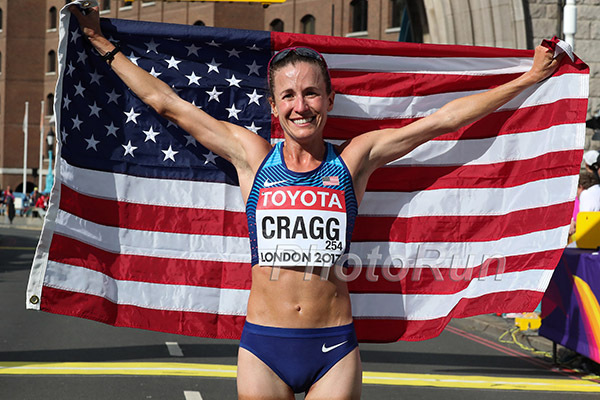 Amy Cragg claimed a historic bronze medal in the women’s marathon at the IAAF World Championships in London today, becoming the first American woman in 34 years to do so. The 33-year-old KIMbia athlete unleashed a storming finish to get among the medals, very nearly taking second as she crossed the line in 2:27:18, the same time as silver medallist Edna Kiplagat. Bahrain’s Rose Chelimo took victory in 2:27:11. The early pace had been slow, but Cragg began to whittle the leading pack with a move just before the 20-mile mark. She had vocal encouragement along the route from coach Jerry Schumacher and husband Alistair, among others. For a full feature story on her outstanding performance, and video reaction from her, check out this story by Runner’s World.